Such angrily stare at an innocent Good American makes many want to lash out with such choice of wording that is not appropriate, in most cases,and never in front of the children.However we understand why "some'feel a need. >Social worker's are always on the feign-"best behavior"attempting to sway the judge insosfar as to why a child who was perfectly healthy happy and moreover, most important SANE need to be stripped away from its parent. Good luck to you all suing pro-se self file. If our founder Ms.Melendez as media news verified, was able to file on her own after 118+ O.S.A. (old school attorneys) tried to mislead her by citing, "Oh you can't sue a state employee, don't even try. "If she was able to hold multiple employees as her daughter's, accountable for the clear act(s)of knowingly wrongdoing with malice against her and her girls causing them years of severe grief,heartache injuries, per civil right violation then there is absolutely no reason why you're not yet executing your timely filed civil rights suit against per state employee violating your constitutional,fundamental, civil rights. Good luck...For help form, click here or easily click on our convienient E-Help form(CONTACT US button on our popular fb page.) Then call the help/hotline to begin..."
It is clear when the owner sued she had ONE MISSION ... While suing, and living in fear her girls would DIE, (facts are PUBLIC in the news) she still started the nation's ONLY learning at the pro-se level of "PROPERLY/the right way' suing pro-se DCFS. She was not forgetting about the "forgotten ones. 'Not at all. She is praised per every other day,by lawyers universal for all she has been able to do with her astute RARE woman mindset. She,and our e-virtual online WON E-LAWSTUDENTEXPERTISE WINNING NETWORK for years realize that so many pages on line i.e., facebook/twitter pages are the same.No action,but with good intent,but no action so if there is no "REAL ACTION" CPS shall, as experts agree daily will continue to violate AMERICA'S most innocent." DO NOT LET A LAWYER NOT SUING FOR YOU, PRECLUDE YOU FROM STARTING A LAWSUIT PRO-SE, when you're "truly" being harmed, violated. 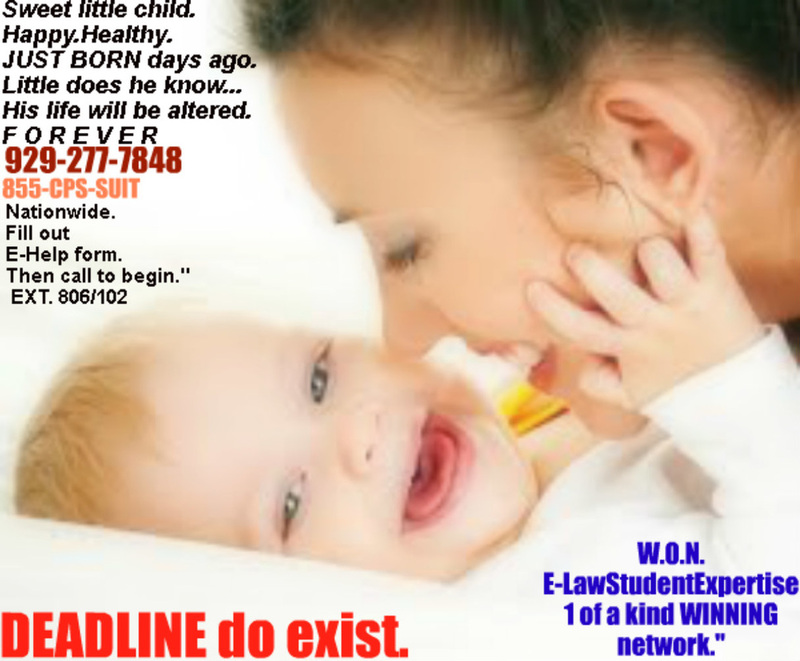 You are more than capable to commence effectively by DEADLINE when suing CPS,DSHS,ACS,DHS,DSS,DCFS. she made sure she would WIN because of one reason..."
She was being "truly violated." Those who are violated, by DCFS,DSS,ACS,CHFS,DFPS,DCF,DFS, DHR DEADLINE EXIST WHICH CASE LAW WHOLLY SUPPORT. Therefore, file your pro-se self file lawsuit and do not spend time online receiving the same negative results,when violated." knew there was just no way a child she raise, loved,cared for,educated and since carrying her girls in her womb,would then learn they are being severely mistreated and gruesomely harmed, let a caseworker get away with such destruction of her own rights." Per weekly session(s) and shall continue to do so when lawyer do not care at all about YOU, YOUR CHILD, your PAIN your RIGHTS." As all nationwide experts coast to coast continue to unanimously agree." No more time would be wasted as so many others online. She knew better than to waste anymore time." ​She knew a lawyer would not care at such time(at initial filing) so she filed on her own pro-se, but not just filed, she had to PERFECT IT and make sure around the clock she was on top of her own pro-se suit and handling it the "right way." No time for a mistake. Clear and concise/carefully/with diligence throughout along with education/empowerment daily by winning expertise. RIGHT(has to be done right everyone)as best as feasible,with such strategic WINNER'S discussion, and preparation pro-se. She knew as the news reports validate if she did not sue, then DCF workers will get away with the destruction of her beautiful girls gia and tia smiles,damages their hearts at only seven years young at the time, and only age 10, for life and moreover hurting her for no reason but to lie under oath, secure a win by malice intent.She remain an inspiration for others and continually is lauded, called upon by even lawyers in california to texas,nj,nys,delaware,arizona,down south,to east west, on all she has achieved by doing it right. No need suing by deadline cps if you're not sure what you are doing. Be sure to realize there are deadlines insofar as throughout the suit, NOT just initial file,(call to learn/start/and take back your POWER, your rights when you're receiving your 1-on-1 POWER session from those who,as verified,already have WON...or remain violated. MASSACHUSETTS, VIRGINIA, NORTH CAROLINA MICHIGAN TEXAS, KY,GEORGIA, OKLAHOMA Nationwide ..."